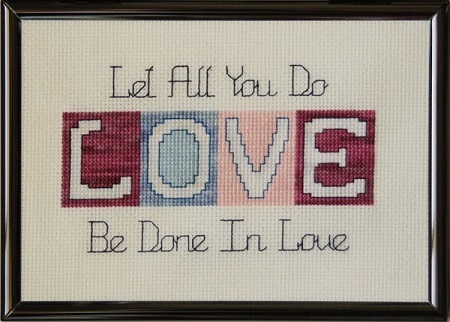 I caught the Cross Stitch Fever when a co-worker showed me the design she was stitching. It was so beautiful and seemed so easy to stitch that I just had to try it for myself. Since then I've never been able to stop feeding my fever! I invite you to browse these pages and find the design perfect for feeding your cross stitch fever. Stitchers, your interest and purchase of my designs is greatly appreciated. If you cannot purchase from a local needlework shop, send me an email listing what you want to order and your email address. Just click the e-mail me button below. 1. Free shipping t0 USA and Canadian addresses on orders of $40.00 or more. 2. Orders under $40.00 to USA and Canadian addresses pay actual shipping costs. 3. All International orders pay actual shipping costs, duties and taxes assessed by customs. invoice link to PayPal. Orders paid by check will ship when your check clears the bank. 6. No minimum order required. Where else can stitchers buy? Here are a few needlework shops . Each of the five leaflets of The Colors of... series charts four different arrangements of the featured colors. A fifth arrangement of the medallions only can be used as a vertical or horizontal border or on banding for a candle or basket band, etc. IT'S ON THE HOUSE! FREE! 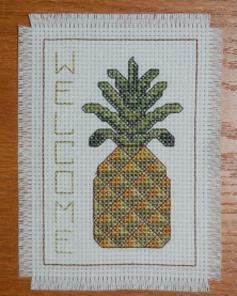 Download the chart for A Little Hospitality by clicking on the pineapple. Charted for Gentle Arts Threads or DMC floss. Stitch count: 36w x 53h. AMERICA Zweigert's 14ct Vintage Blue Whisper fabric supplies the spacious skies, you stitch the rest! Be sure to place the fabric pattern horizontally. Stitch ct: 271 w x 100h. SRP $12.00. Stitch Welcome once then change the overall look with separately stitched and attached panels like the snowflakes shown. All the separate, attachable designs have a stitch count of 128 w x 34h. Both Welcome and the separate panel designs were stitched on Zweigert's Smokey White 14ct Vintage Aida (#1079). Finishing, attaching and framing instructions are included in the Change It Up Welcome Leaflet. More panel designs are in the making! 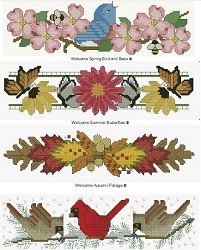 Welcome the Four Seasons A booklet of four designs suitable for use with the Change It Up Welcome pattern. Each of the four patterns are also available singly. Three designs in one leaflet. Model stitched on 2' wide, 16ct stitch band. 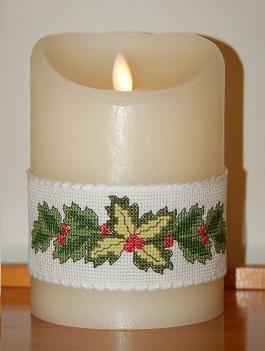 Finishing instructions for tie-on candle band included. Trellised Petals Choose from 3 color schemes. Charted for Sulky® 12 wt cotton thread. One strand replaces 2 strands of embroidery floss! 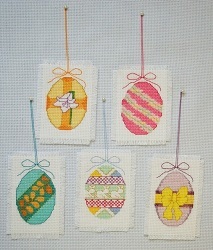 Stitching is easy peasy! Stitch ct: 76 x 76 SRP $10.00. Charted for Sulky® 20 wt. cotton thread.